Brian Grote made a misleading statement that has been repeated. He said that the "wider sheen,  has a thickness of one or two hydrocarbon molecules" (as quoted in Upstream Online http://www.upstreamonline.com/live/article213244.ece?WT.mc_id=rechargenews_rss). The idea that a layer of oil on water will spread until it is only one or two molecules thick dates to Lord Rayleigh in the 1890s. He performed an experiment where he allowed a small drop of oil to spread in a tank. When it reached its maximum extent, he correctly surmised that the layer was ~1 molecule thick. However, he could not SEE the oil; instead he inferred the extent of the layer by floating camphor power on the water. And he got a number of 0.01 micron. This is NOT what is happening offshore Louisiana. The open ocean is obviously not a laboratory tank. Visible oil layers have to be at LEAST 1 micron thick–even then you are not seeing the oil, just the reflection of light off the layer. An oil layer with a rainbow sheen is ~10 micron thick. Oil with red or brown color is several times thicker than that. Unfortunately this is exactly what we are seeing across much of the Deep Horizon spill. 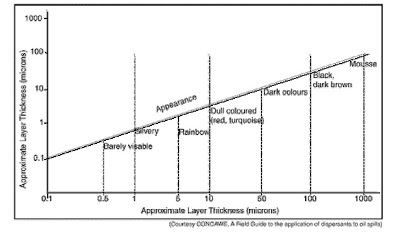 Misstating the thickness of the main sheen by a factor of 1000 has a direct effect of reducing the estimates of spill magnitude. The point is, even at 10 micron these are still not thick layers. They are 1/10th the thickness of a human hair, but they cover enormous areas. The areas add up to a very large volume of drifting oil. I would think that there is additional oil spilled beyond these estimates. I understand that the oil is continuing to leak at the ocean floor 1500 metres below the ocean. I don't know how long it would take for that oil to rise to the surface, but it will take some time. So in addition to the oil on the surface, there is also the non-visible oil below the surface. Thanks Yens – we think most of the oil now at the surface that we see in these satellite images did not come from the rig itself (which had a reported 700,000 gallons of diesel fuel on board), but has been leaking almost continuously from the damaged well on the seafloor and floating steadily up to the surface, where wind and current are spreading it around across a large area. The slicks we're seeing now are a direct result of that continuing leakage on the seafloor. 4um is 4000 nm, which is not in the visible spectrum. 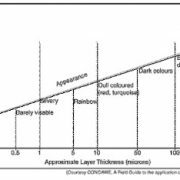 The visible spectrum runs approximately from 400-700 nm. Got to beach house last nite; this am breeze off gulf has very definite petroleum smell & it is still miles away from us!!! 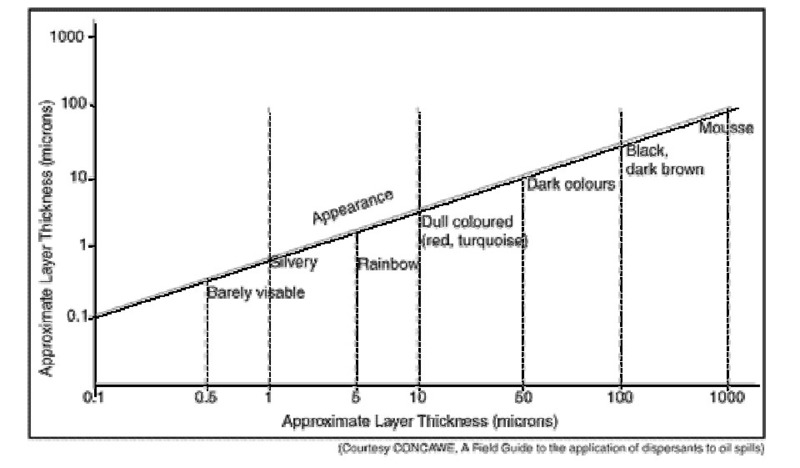 I don't understand the graph, since both axes are labeled "Approximate Layer Thickness (microns)." Is the y-axis mislabeled? If so, what should it be?